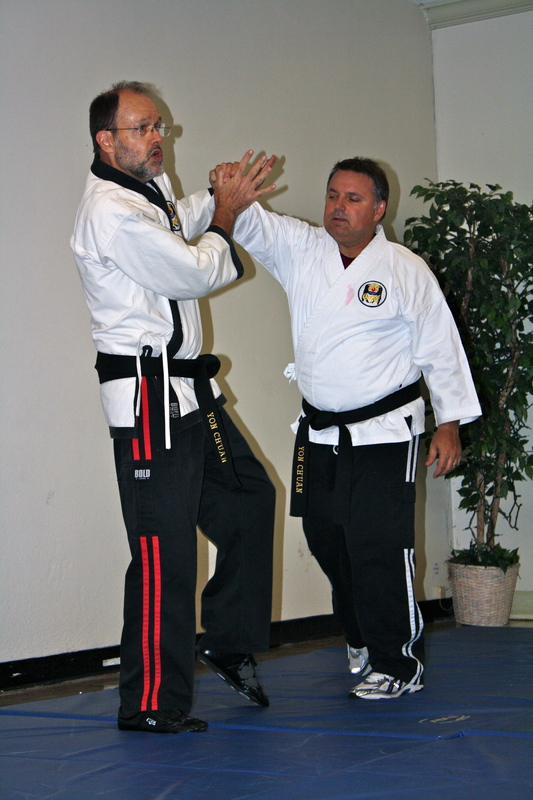 The Yon Ch’uan Martial Arts System incorporates three zones of self-defense training. The Three Zone Defense © theory is a seemingly simple action, however it is loaded with subtleties that require years of practice to perform them succinctly with total relaxed mind/intent and body integration. Mind/intent is the neutral point between cause and effect. As you relax the mind and body to reduce tension, your physical body and conscious mind will find a neutral point between cause and effect so that your thoughts can cleanly and succinctly be expressed through unconscious physical action. The First Zone (physical contact applied) and Second Zone operate within the sphere of the practitioner’s physical space and teaches, superior kinetic body alignment and sensitivity training. Classical Chinese Kung Fu rooting methods, mid-line blocks and parries, throws, submission holds, pressure points, locks, escapes and counters are an integral part of the First and Second Zone training methods. The Yon Ch’uan defense principles emphatically instill not to meet force with force, but rather yield and overcome aggression through the redirection of force, restraints and submission holds, evasion, absorption, reflection and escapes. In like manner the Second Zone, within the sphere of the practioner’s physical space, is sometimes the most difficult zone of defense to defend from compassionately because of lag-time reaction. The use of an ancient anatomy charting method which loosely translates as “mid-line quartering” allows the practioner to maintain control of the attackers midline and with skillful ability neutralize and immobilize the aggressor with minimal effort or bodily harm to the aggressor. The same defense principles apply for the Third Zone, not within reachable space of the aggressor’s attack. The practioner learns how to utilize an attacker’s strength and weaknesses to effect easy-to-use escape skills and to avoid injury. Maximum efficiency of self-defense skill is realized through economy of movement and least muscle resistance.